Before we start, I’ma just give the disclaimer that there is lots of caps lock happening all up in here. What can I say? I’m getting more and more excited about the giveaway. Cue: next prize reveal, aaaaaannnnndddd…. GO! A while back I bought a couple series of Knitting Daily from Interweave (because I’m a total Interweave and Eunny Jang fan-boy. Not mad.) and one of the episodes featured Kristen TenDyke demonstrating some of the techniques she implemented in her book “Finish-Free Knits”. Picture if you will my shrieking “WHAT IS THIS FANCY YARN MAGIC!? I NEEDS IT IN MY LIFE, I DOES! TELL ME FOR HOW, KRISTEN, PLEASE AND THANK YOU KINDLY TO YOU PLEASE!” while pawing frantically at the screen. * I promptly ordered the book from Interweave. And then Kristen began selling signed copies from her Etsy store. So naturally, I bought myself a signed copy too. *may or may not have been embellished for dramatic effect but preserves the essential essence of the moment as I recall it. So, if you’re reading this now, you could very well have a copy of this most esteemed and wonderful volume in your own little paws! The giveaway copy is not signed, peeps. That one’s for me. Sorry! I did think about getting another signed one for the giveaway but I couldn’t afford it. Never the less, you’ll still be able to make the most divine and miraculous of creations with NO finishing required other than weaving in your ends. IT’S LIKE WITCHERY WITH YARN. IS THIS BOOK A GRIMOIRE OF FIBER SORCERY? Totes is. True facts. There’s ONE reveal to go, and then y’all can have at it! Are you excited about the prizes so far? The first image is a photo of the book itself. The images of designs from the book were used with Kristen’s permission and are credited to Joe Hancock. The last image is from Kristen’s website. You’re killin’ me… you know that, right? 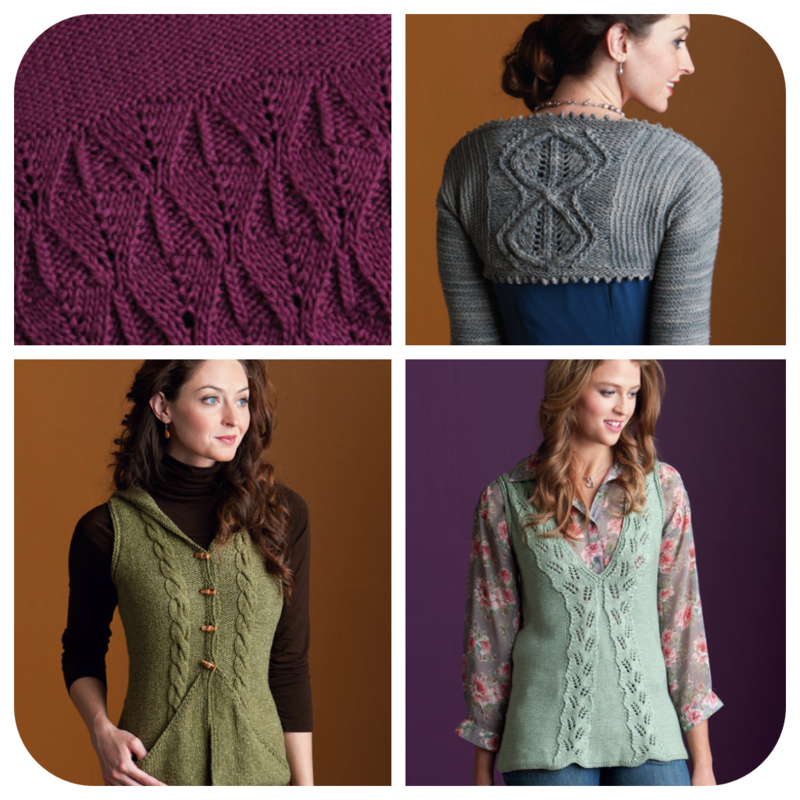 Ugghhh, I *need* to learn to knit better so I can all these amazing things!! ♥ it! I’ve been lusting over that green vest for a while, and I’m looking for something a little more challenging right now. Something to sink my teeth into, you know? I demand to see a step-by-step of the manlination of the bottom left vest. Because that vest is totally awesome. And don’t tell anyone but… I kind of like the finishing part of knitting… It makes me feel all smart and stuff. You know, until I inevitably stuff it up and swear I’ll never sew another seam. Eeep! They are gorgeous. I want the Bliss shrug. And the Divine hoody vest And the Warmth top. And the Harmony dress. Nuts, I want to knit the lot of them.